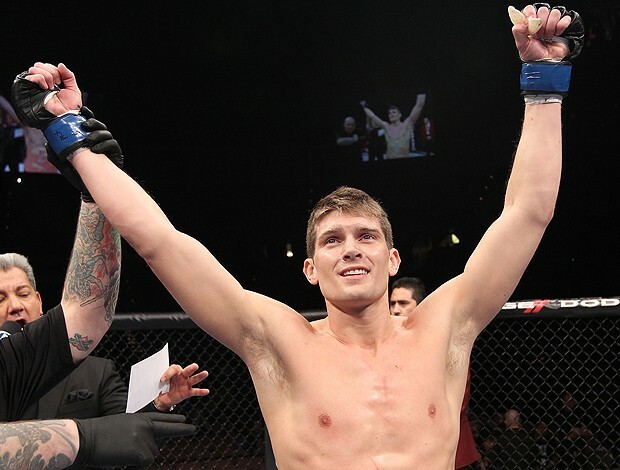 Home / MMA / Will Raczkowski / The Karate Kid: Is Stephen “Wonderboy” Thompson Destined for Gold? Johnny Hendricks’s nickname “Big Rigg” was one of the most fitting ever. A two time national champion collegiate wrestler from one of the most prestigious programs in the world, the powerhouse wrestler transitioned to MMA flawlessly, compiling a record of 15-1 before facing the legendary George St. Pierre in battle for Welterweight gold. He had devastating power in his left hand, knocking out 9 of his opponents in that stretch. Hendricks would lose a VERY controversial split-decision to the champ, but capture the gold in his next fight, defeating Robbie Lawler to become the welterweight champion of the world. He would go on to lose the title, in another contentious split decision to Lawler, before grinding out Matt Brown in his next fight for the victory. He wanted one more fight to prove that he had the right to challenge again for a belt that he felt was rightfully his, and got his wish in Stephen Thompson, but it didn’t turn out as “Big Rigg” would have hoped. Stephen “Wonderboy” Thompson is an elite striker. In my most humble opinion, the unquestionably best striker pound for pound in the UFC. “Wonderboy” was a 6 time world champion kickboxer in two different weight classes, as well as a 10 time regional and national kickboxing champion, going undefeated for the entirety of his kickboxing career. He stormed into the UFC, flying into the world’s largest MMA promotion at 5-0, before beginning his career in the UFC with a highlight reel debut KO. Following his debut fight, he ran into the perennial contender Matt Brown, losing a decision, but went off on a second tear, winning 5 straight with 3 KO’s before agreeing to meet Hendricks. However, few gave the talented striker a chance against the former champion, claiming that Big Rigg’s wresting would be too strong, and Thompson would likely lose a boring decision at the hands of the powerful grappler. Turns out…Thompson had different plans. In the course of (just under) three brutal minutes, Thompson destroyed the former champion, landing punches and kicks at will before forcing Hendricks to the fence with strikes and crumpling him with an onslaught of punches that was legitimately hard to watch. Robbie Lawler, Carlos Condit, GSP, no one had really given Hendricks much trouble throughout the course of his career. In fact, those three UFC champions hadn’t even come close to finishing Hendricks on their feet, but Stephen Thompson crushed him in just about half a round. What Thompson brings to the table is a truly elite level of striking unlike anything we’ve seen before in MMA. Anderson Silva and Connor McGregor have showed impressive movement and excellent power in their shots, but the technique of Stephen Thompson was honed by fighting genuine experts in striking throughout his kickboxing career. 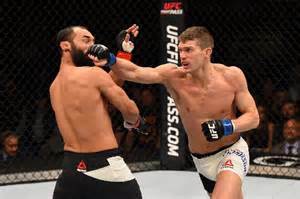 Men whose sole focus was striking and not getting hit, sharpened “Wonderboy’s” hands and feet into devastating weapons. As a result, Thompson may have set himself up for a shot at champion Robbie Lawler, who is currently providing the UFC with one of the most thoroughly entertaining title reigns of all time. Lawler has provided us with two back-to-back fights that could easily be considered among the top 10 fights of all time. He has knocked out the young phenom in Rory McDonald, and battled “The Natural Born Killer” Carlos Condit to a split decision victory that seemed like the closest possible thing to a draw that a fight can be. He also defeated Hendricks before that in an entertaining scrap to win the belt, and established himself as a legitimate alpha-male in one of the UFC’s most dangerous divisions. However, does Lawler’s ferocious power hold up against Thompson’s devastating technique? The problem that Robbie Lawler has, that makes him so fun to watch, is his genuine love of a brawl. He loves to get bloody and bloody people up. His fights are a symphony of violence (particularly with Condit), where shins, fists, knees and feet flow as an orchestra, creating a performance of elegant brutality that no one can ignore. However, he’s never faced a fighter with the striking acumen of Thompson, and Thompson is quite the maestro of violence himself. His mix of surgical precision, jaw-dropping power and action-movie flash makes Thompson easily the biggest threat to Lawler we’ve seen so far. With a confrontation looming, the UFC’s most violent striker is likely going to meet the UFC’s flashiest striker in a Welterweight battle for supremacy. The Stephen Thompson hype-train just left the station everyone, I would suggest you get on it before it’s too late.